Veggie Grill is a West coast chain, with locations throughout California and up into Oregon and Washington. It is, as near as I can tell, some kind of attempt to pitch vegetarian cuisine as a sort of All-American comfort food. I want to say “like Applebee’s except made of soy” but I think they’re aiming higher than that. I hope they are. You get the idea. “The perfect indulgence,” they say. Pitching tempeh as an indulgence is a new angle, and I wish them all the best in their quest. The tempeh is joined on the bun by lettuce, tomato, red onion and chipotle ranch. That’s the official list from the menu, anyway, but what ended up interesting me was the garnish. 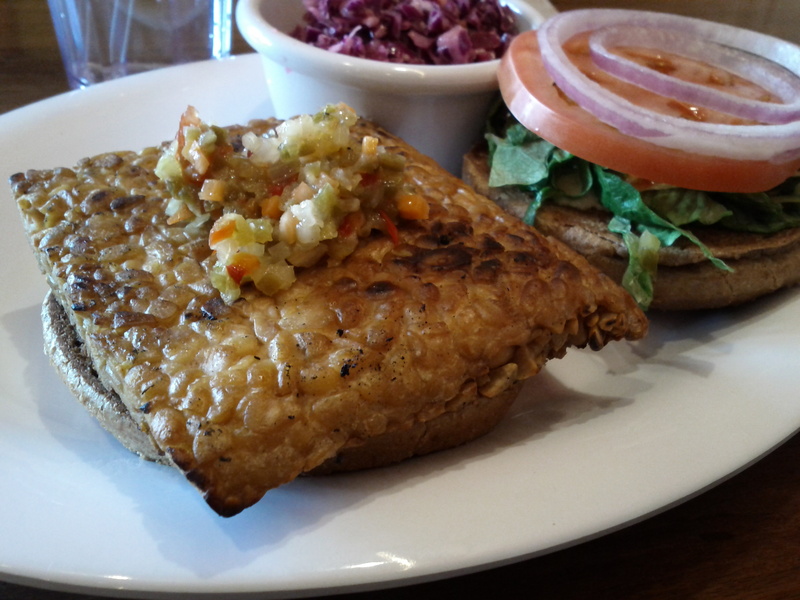 As you can see square in the center of the above tempeh patty, there’s a bit of relish. It was as tangy and tasty as your standard relish is, and it would have gone a long way into making this something special. Lettuce/tomato/red onion is a storied lineup, but it doesn’t exactly make me think that there’s something special going on. And that’s about the summation of this sandwich; there wasn’t much special going on. A liberal dose of hot sauce brought some flavor to things, but the sandwich itself was a bit bland and rather disappointing. The relish may or may not have saved things, but sitting around and wishing for a condiment is no way to spend a meal, and the Veggie Grill didn’t do much to help me avoid that fate. This entry was posted in Sandwich Reviews and tagged Los Angeles, Reviews by Pete, San Jose, Sandwiches I Have Eaten, Vegetarian by Pete. Bookmark the permalink. Though I have yet to cover them on the blog, I’ve been to Native Foods a number of times and agree, they’re a step above Veggie Grill.